There is a great bloke by the name of Angus Giles from Café Lua in the wonderful Melbourne suburb of Carlton. Angus and his crew are on board with Ground to Ground! So much so that he has made this amazing poster available for all to use. You can either copy and save the image above or download the A4 sized PDF file here. And you can download the A3 sized PDF file here. I know a very talented reporter named Michael Green that happens to be a customer of Café Lua. These two guys are already involved in a range of environmental initiatives and I am honoured to see Ground to Ground counted among them. Tags: Café Lua, cafe, coffee shop, Ground to Ground, Poster. Bookmark the permalink. I’m also wondering about the whole “waste coffee grounds” issue from a workplace perspective though. I work in one of the wine regions of South Australia and know the insatiable appetite winemakers have for good coffee – hence at our winery we have a real coffee machine and lots of resulting grounds. I would dare to bet its a pretty common scenario throughout the wine industry, both in Australia and abroad….? So I was just wondering if the wonderful Angus Giles, or another generous soul well endowed with design gifts, would be interested in producing a version of this poster for workplaces? Hi there Mel, thank you for stopping by the site and saying hi. We have a huge opportunity here mate, anything you can do to help out is a good thing to be doing, so do let me know how I can help you out. Will be sharing posters soon from other organisations also – councils and TAFEs. Cool, thanks. Well if one of the posters from another organisation is relevant (or easily amended) we might be onto something. I was thinking i could then send it on to our regional wine body (here it is the mclaren vale grape wine and tourism association). There will be similar associations in most wine regions i imagine…. Anyway, lets start with the poster first and go from there – looking forward to seeing what you have. Hi. Fab poster. I’m trying to get some kind of take up on this idea in my area. Your download link isn’t working though…. Oops sorry! All working now. Love it! How do I get one? Hi Corrie – you can download the PDF directly from the site now. This is wonderful. We are a small community organisation in WA and have an arrangement with ONE coffee shop in the suburb which probably has about 15, and that keeps us flat out in the community garden making compost, feeding worms etc.. Important thing if anyone has an arrangement with a business is to be consistent, reliable and pick it up on a regular basis. In most places organic material from commercial locations is sent to landfill so any initiative like this is to be promoted. Contact City Farm in Perth too as they are investigating ‘growing mushrooms’ on coffee grounds. Well said Peg and thanks for stopping by. It is very important to maintain those things when the expectations have been set. 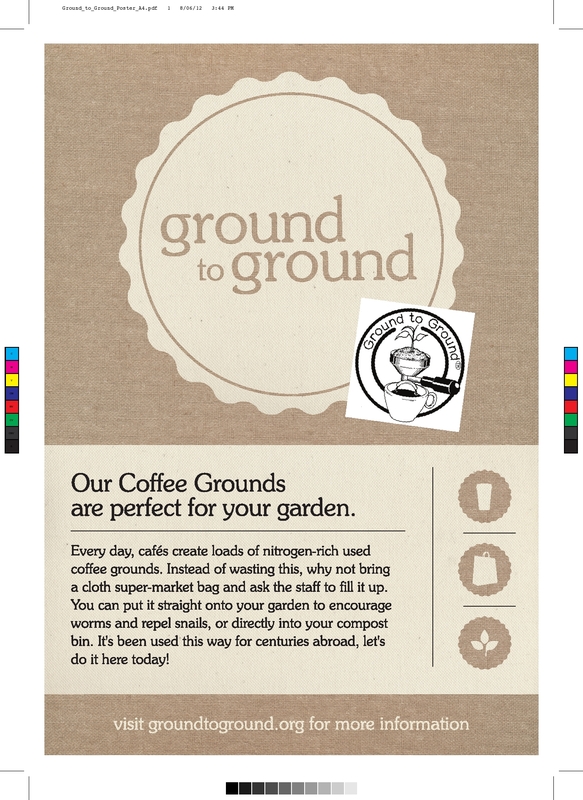 I hope all those coffee grounds are coming in handy and you see the results in the soil and plants. Checked out your site – fantastic. How do we reach the other community gardens over West? Many are on to it already. But I will send link on to them. Maybe look under ‘WA community gardens’ will get the contacts. Thanks Peg – appreciate the help in spreading the word!